I know that any review I write will not do anything Elizabeth did justice but I of course had to. Elizabeth made any and every floral dream of mine come true on my wedding day. She put up with my random late night emails and texts worrying about the way things will look and she would call me assure me over and over again that she had it under control and she understand my crazy color vision…and the day arrived and she was right. She exceeded any expectations I had and blew me away. From her initial proposal she walked me through online (because I was planning from Washington) I knew this gal was amazing. Every thought and detail she planned out ahead of time literally was the entire reason my crazy color ideas finally came together. My entire vendor team couldn’t stop talking about my bridal bouquet, it was seriously one of my favorite parts of the day. It was STUNNING, and I would give anything to have had it forever. I focused my money on my bouquet and the bridesmaids bouquet and went simple for my centerpieces and yet she still made the tables stand out and look amazing even in their simplicity. Elizabeth is one of the sweetest people ever and I instantly felt like she was a great friend I’ve known forever. She is punctual, professional, organized, and insanely talented. I can’t say enough good things about her. I loved working with Elizabeth. She did my sister’s wedding a year ago and I fell in love with her work, so I had to book her! 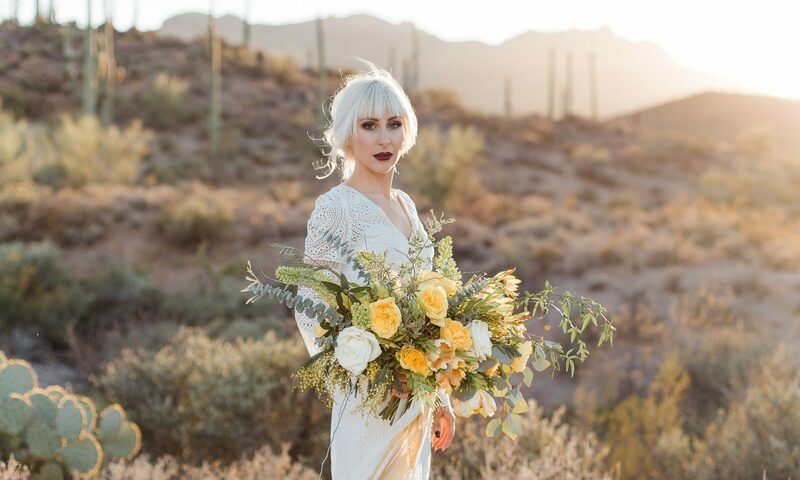 We wanted bright southwestern flowers without looking “hipster.” Elizabeth completely got out vision and when I saw my bouquet on my wedding I couldn’t help but tear up. She did a beautiful job and was so easy to work with! We would like to thank you for such amazing florals at our wedding. Your talent was a highlight of our special day. Hyon-he absolutely loved her bouquet – the flower choices, colors and rose scents. You customized a beautiful display that could not have been more perfect. the arch was gorgeous and we really appreciate all of the hard work you put into it. Thank you for working so closely with Hyon-he and she appreciates your sincerity, kindness and dedication to the art. Your beautiful work will forever he cherished in our wedding photos, Thank you again!!! I would highly suggest hiring Elizabeth with A Floral Note! She was amazing throughout the whole process and made things run so smoothly from deciding on which flowers to use, colors, design, staying within our budget & delivery! She adds such a personal touch to the process that makes the bride & groom as well as the wedding party feel so special! Elizabeth is amazing! You won’t be disappointed if you hire A Floral Note!!! Elizabeth I have known for a couple of years now and what she loves it shows in her work. She did my wedding and went beyond to make my special day very SPECIAL! I highly recommend her and she will make your day special day just as SPECIAL as she did mine. She is very easy to work with.